Over the course of your tenure with Profit Rhino, you may find yourself in one of the following situations: Needing to purchase or cancel user licenses, needing to update your credit card information, or wanting access to your invoices in regards to charges from Profit Rhino. This article will detail the process for handling all of the above situations, and allow you to keep your Profit Rhino account in line with your business needs without needing to reach out to a representative in most situations. 1st. 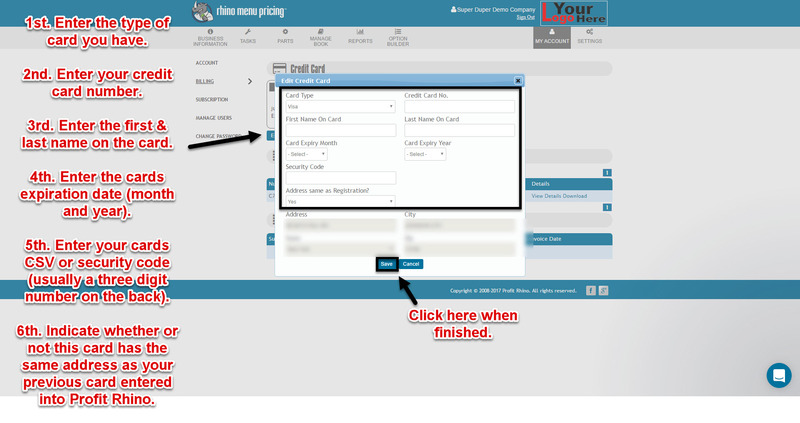 Log on your Profit Rhino account from your web browser (not the tablet for those of you using our mobile). 3rd, Click on the Billing section found on the left. Now that you've made it to this section, all you'll need to do is click the edit buttoned outlined in the image above (resting right below the picture of a credit card). In this pop-up dialogue, you'll just need to enter the information for your new credit card. The specific information we'll need is listed in the image above, but I'm sure you'll find it's pretty standard fare. Upon entering that information, click on the save button. Upon doing that, you should see that your billing information has been updated in Profit Rhino. Now, lets say it's been a month since you've updated your billing information and you want to make sure the correct credit card was billed. In order to do so, return to the same billing screen we were just working in. This, obviously, is your invoice. It should have the charges on your account for the particular billing cycle you're looking for. If you click the download portion instead of the view details portion, you'll get this invoice in PDF form. For any number of reasons, you may find yourself needing to increase or reduce the number of mobile user licenses you're paying for. Additionally, some of you folks may find yourself switching to a new field service software, such as service titan or field edge, and wanting to bring all of your Profit Rhino information with you. In either of these cases, you can of course reach out to a sales or support representative at Profit Rhino, but you also have the ability to make these adjustments yourself. 1st. Log on to Profit Rhino from your web browser (Not from your tablet for those who are using the mobile). 2nd. Click into the [My Account] section. 3rd. Click on the Subscription section found on the left. As you can see, from this screen you have a multitude of different options available to you. 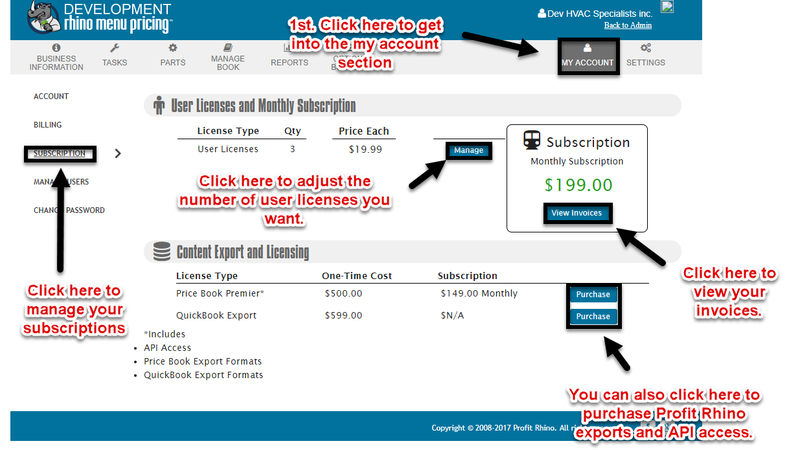 By clicking the [Manage] button show in the image above, you can increase or reduce the number of licenses you have on your account. Please do keep in mind, if you currently have five licenses and you try to reduce it down to four licenses, as an example, you'll need to inactivate one of the user accounts first. For our mobile users, if you make the switch to a different field service software, you can click the purchase buttons listed under the content export and licensing section in order to gain excess to Profit Rhino exports and API. This will allow you to port all of your Profit Rhino book into your new field service software. As with most things dealing with purchasing or canceling anything with Profit Rhino, I do recommend you speak to a sales or support representative, but you should now be able to handle most interactions straight from the website. Good luck.